Can confirm that I had the same issue over a month ago. Topic: F12 doesn't work how can I change hotkey? Re: F12 doesn't work how can I change hotkey? A poke in the dark, but did you try disabling fullscreen optimization on bandicam and/or your target games? That feature broke a lot of things. Try downloading from the Europe server. Thank you for caring about community suggestions! I've been waiting eagerly for this feature. Thank You! NVENC is still present and working across multiple apps. Topic: Screen tearing in recording, but not actually on screen. Re: Screen tearing in recording, but not actually on screen. Can you provide a screenshot of the video having tearing? There are only a few that are officially supported such as X264 and Lagarith. You can try others for yourself and you can check https://www.bandicam.com/faqs/vfw-x264- ... 264-codec/ for reference. Other codecs may either work or crash. I've had (still do) similar issues. The samples are unavailable, but they were the same also the same NVENC codec. As you can see there was no way of fixing it, at least back then. Topic: Importing an audio file, Mp3 for instance. Re: Importing an audio file, Mp3 for instance. Like I've said, your wording was confusing. I do know the answer and the answer is no, that's why I tried to explain what Bandicam does and what possible solutions you could use instead. 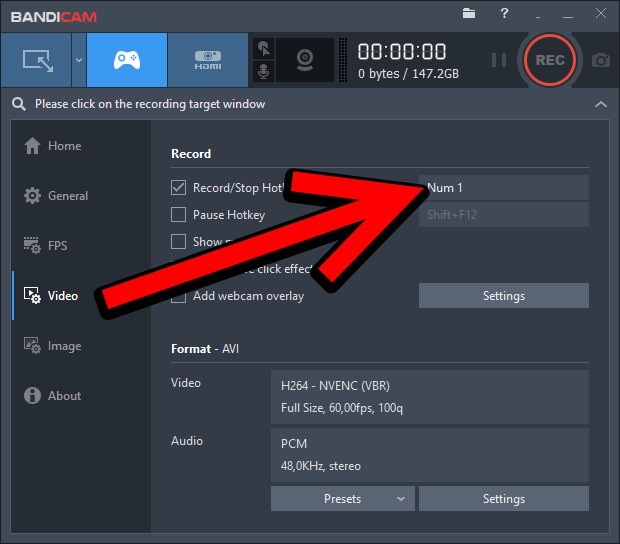 You can not import external audio into the recorded footage or during capture itself through Bandicam. PCM, 48Khz seems to have 0 desynch for me.